Summerseat is perhaps most famous for being the Headquarters of General George Washington from December 8th to 14th, 1776. 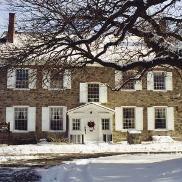 Summerseat was built in the 1770s for Thomas Barclay, a Philadelphia merchant, and acquired by Clymer in 1806. The two-story brick and stone Georgian structure is built over an elevated basement. The house was restored in 1931 and renovated for use as a school administrative building in 1935. Today it’s operated by the Historic Morrisville Society.